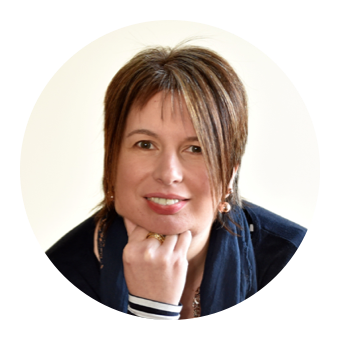 There appears to be a designated day or week for every food product under the sun these days, with some being more worthy of such an accolade than others. Surely there can be no denying however that the nation's love of Sandwiches truly deserves a week long celebration. As such we are currently in the throws of none other than British Sandwich Week which runs from Sunday 8th until Saturday 14th May 2016. 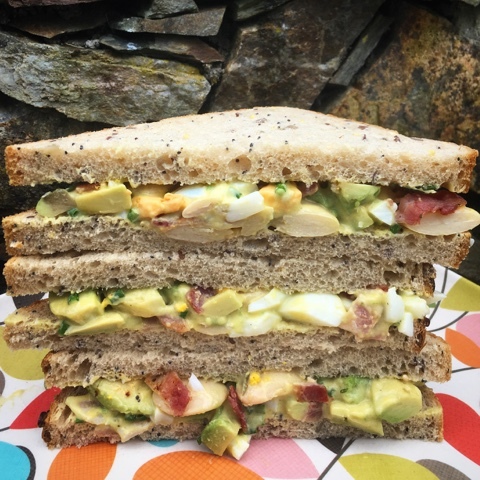 The Wall Street Journal has described the Sandwich as Britain's "biggest contribution to gastronomy". It was named after an 18th century English aristocrat John Montagu who held the title of 4th Earl of Sandwich. Apparently he ordered his servants to bring him meat tucked between two pieces of bread because it allowed him to continue to play cards and eat without using a fork or getting his cribbage cards greasy. Others began to order "the same as Sandwich", the name stuck and the rest, as they say, is history. 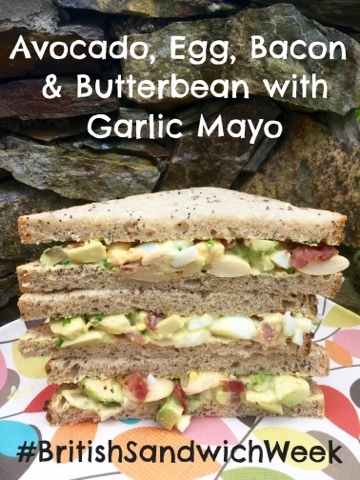 In association with Warburtons the sandwich filling recipe I'm sharing today is one that appeared on the lunchtime menu of Aberdeen's Lemon Tree Arts Centre when I used to work there back in the noughties. You could have it as a baguette or baked potato filling and it was also available in a vegetarian version sans bacon. It's something that I've often recreated myself in the intervening years and it also works well on its own as a salad. I always use free range eggs, mine were from a local farm shop honesty box and had amazingly brightly coloured yolks. My bacon came from the Farmers Market and crisped up perfectly with none of that horrible white water. Chives from my garden and a nice firm Avocado. I favour the ripe and ready ones. 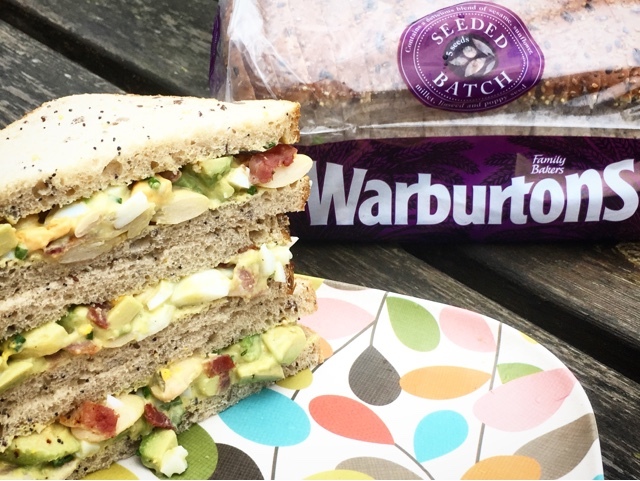 Finish off with your favourite Warburtons bread product for the perfect sandwich. This makes enough for 3 or 4 sandwiches depending on how generous you like your filling. It also works well as a salad or baked potato topping. Hard boil your eggs then cool and roughly chop them. Fry or grill the bacon until nice and crispy. Drain on kitchen roll then cut into small pieces. Peel, de-stone and chop the avocado flesh. Drain the butter beans and tip them into a bowl. 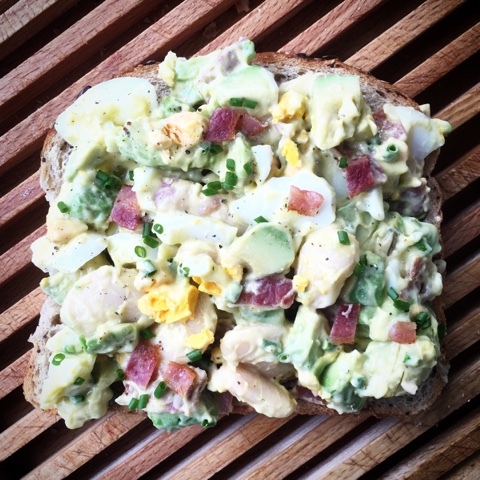 Add the egg, bacon and avocado and combine with approximately 3 tablespoons of Mayonnaise until the consistency is to your liking. Season with crushed garlic, chopped chives and freshly ground salt and pepper. Spread on a slice of Warburtons Seeded Batch Loaf or on your favourite Warburtons Bread. Top with a second slice of bread and voila, you have a sandwich! 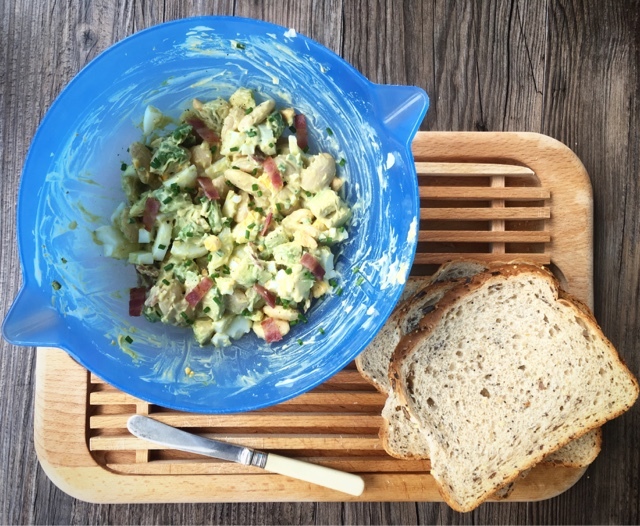 Throughout British Sandwich Week 7 bloggers are taking part in the challenge of creating an ultimate sandwich filling recipe in conjunction with Warburtons. 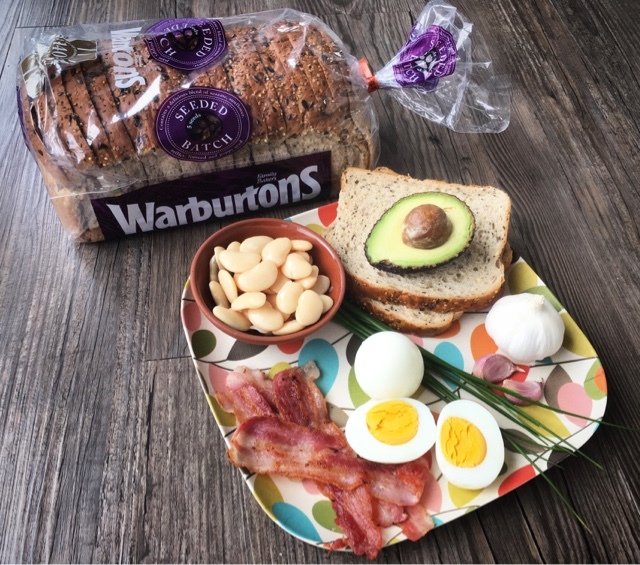 Eileen kicked off the week yesterday with a fab idea using Warburtons Toastie and I'll link up all the others as my fellow bloggers share their creations over the week. Disclosure : This is a commissioned recipe for Warburtons. All views expressed are my own. This sandwich look lush! I love all the mix! So yummy! Thanks Eileen, I'm definitely going to be trying out your Strawberry and Cream Cheese combo. Wow! What a sandwich! And I'm hungry for lunch now...! We had this yesterday for Sunday Lunch alongside crisps. Hope you have something equally tasty for your lunch today. Oh, that does look like a really really good sandwich. I'm very lazy with mine and rarely think to put multiple ingredients in but yours really does look so good. There are a whole world of amazing sandwich filling combinations out there for you to explore. Be adventurous! This is right up my husbands street, I've never had farmers marker bacon before so will have to give it a go! Hate the juice and shrinkage from bacon normally. Warburtons is also my favourite packaged bread- good choice! This bacon was SO good. Well worth spending a wee bit more on and supporting a local pig farmer. Oh yum! That's definitely my kind of sandwich. I'm not too sure about the sandwich being Britain's biggest contribution to gastronomy though - personally I'd give that accolade to the Yorkshire pudding. Also, you've reminded me that I need to plant some new chives because mine died over the winter (as most of my plants seem to :-( ). I really like when sandwich looks so delicious! It makes so much difference as I do believe I eat with my eyes.